Spend enough time in the business world, and you’ll encounter event marketing in some form. Spring is here, and with it comes a new look for 41 Orange! If you hear the term “inbound marketing” more than seven times a day, you’re probably familiar with Hubspot. This popular all-in-one marketing automation, sales enablement and CRM software allows for effortless lead generation and detailed ROI measurements, all under one user-friendly interface. If you’re reading this, chances are you have a LinkedIn Profile. Professionals from nearly every career field imaginable use the service; according to LinkedIn, there are over 600,000,000 LinkedIn users. If you’ve ever produced content for public distribution, you’ve probably struggled with lack of awareness or engagement— it’s the most daunting part of the process. With its many awesome built-in features, WordPress can be a marketer’s best friend. But with all the changes constantly being made to the platform, along with all of the new search engine-related items to keep up with, it doesn't hurt to keep a few extra friends by your side. Here are five WordPress plugins that we think you need. With over 1.5 billion websites on the internet today, your brand isn’t the only one competing for the attention of your audience. Your content marketing strategy needs to be more creative than your competition’s. Back in 2016, only 45% of marketers said blogging was their #1 most important content strategy. I’m just going to say it: if you’re not utilizing email in your B2B marketing strategy, you’re already doing it wrong. Some skeptically note this method as “inbox spamming” but that’s far from the whole story—in fact, a study by the Data and Marketing Association (DMA) concluded that for every $1 spent, there is a $38 return on investment (ROI). Everything from formatting to collaboration, we have compiled a list of the best hacks for Google Docs that we’ve come across. It’s the start of a new year and the perfect time to get a fresh perspective on your brand’s marketing strategy. Luckily, there are plenty of quick wins that can be easily incorporated into your marketing strategy this year. An example is to focus on expanding your social media marketing reach. How are you looking to increase your brand’s presence on social media platforms in 2019? If you’re not creating and posting videos for your company’s LinkedIn account, you should be. Here’s everything you need to know about LinkedIn video for 2019. Where you land in a Google search engine ranking can mean everything for your business’ success. Just like a good location for a brick-and-mortar business, a good search engine ranking makes your online business easier to reach. The problem is there are just way too many websites out there for Google to search every site. If you want to make the list, you are going to have to find a way to boost your search rankings. When it comes to the production of a product, we’ve all heard of the economies of scale. The more you produce, the easier and more cost-effective it is. However, the same isn’t necessarily true when it comes to content production. As people visit your website, they are learning all about the services you provide and who your customers are. When a visitor clicks on the website about page that means they want to know more about your company and why it exists. There’s nothing more frustrating than spending hours, days, even weeks on a piece of content only to post it and have it get little to no traction. When it comes to content creation and more importantly, distribution, scalability is what’s important. The perpetual evolution of the technology used in digital marketing has gradually abated human intellect as a mere supplement to the rapidly maturing world of artificial intelligence — and 2019 trends will, no doubt, continue to confirm that. Every year, marketers test out new apps, software and distribution channels to find the most effective avenues for their marketing promotion. And let’s be real, every day we could look online and find a new tool to try out. The options are endless. The internet is a comprehensive accumulation of content in every virtual shape and form. According to Brandwatch.com, 91.8 million blog posts are published monthly on WordPress alone, 3.2 billion images are shared daily on the internet and Google processes more than 40 thousand searches per second. Just by reading the headline of this article you may be thinking “I already know how to measure the return on investment of my blog.” After all, checking your click-to-conversion data is relatively simple. However, calculating blogging ROI isn’t as straightforward as other ROI data. Grab your phone, unlock your screen and check out your social media apps. Galileo Galilei said it best, “Count what is countable, measure what is measurable, and what is not measurable, make measurable” He probably wasn’t thinking about Return on Investment (ROI) and Key Performance Indicators (KPI) when he said that, but we are! More than half of digital content consumption happens on mobile devices. In fact, users spend about 69% of their media time on smartphones. It’s essential to create content that is not only mobile responsive but also optimized and appealing. Visitors are more likely to become customers if they have an easy and enjoyable mobile experience. With more people using their phone to read emails than to make calls, it’s essential to prioritize mobile device optimization when creating content. If you’re a social media wizard or are still wondering “what does hashtag mean” or “what are hashtags used for” then this guide will help you maximize the potential of hashtags, and help you ensure increased traffic for your business. Pay-per-click (PPC) management is crucial to a successful marketing strategy. How crucial? It is estimated that businesses earn $2 for every $1 they spend on PPC campaigns – when they’re done correctly. If a part of your job involves sales, then you’re likely already well aware of how important communicators are. The ability to persuade someone’s viewpoint is vital in a sales role. Selling is the art of convincing people to think the way you do. Whether you’re selling a product or service or you want them to invest in your company, the root of all sales is being an excellent communicator. When you sit and think about it, documenting your marketing strategy is a no-brainer. Of course, you’d like a well thought out roadmap that will show you where you are, as well as where you’re going. However, the reality is that in the hustle and bustle of ongoing projects and sudden campaign opportunities it feels like there isn’t always time to document your content marketing strategy. In fact, only 37-61 percent of marketing professionals do document their content strategy. What can get forgotten in the content marketing world, when examining your website and improving its design, is that the whole purpose of your website is to maintain and/or increase sales. Your website is the main, and often first, point of contact for your customers, and how successful your business is can depend on how well your website is set up for lead generation. Influencer marketing has become a driving force for brands to expand their reach and grow their audience. Influencer marketing isn’t just about Instagram, Youtube and promoting products and services; it’s about earning people’s trust. “Content is king!” How many times have you heard that over the last three years? I’d guess it’s more than you’d like at this point. Though it’s a hot topic and thrown around frequently, it’s not a phrase that’s going to go away anytime soon. Using visual content is critical in this day and age especially on social media. According to Brain Rules, people only remember 10% of information that they heard three days ago. However, if that information is paired with a relevant picture, people retained 65% of that information three days later. The Million Dollar Question: Are Social Media and SEO Correlated? Isn’t it strange how, despite living in a day-and-age where we as marketers have as much data as we could want – and often more – the customer experience remains depressingly generic? The content marketing world is changing. We have hit and surpassed the peak of its effectiveness in its current state - but don’t panic - this is a good thing. All things need to evolve to stay relevant as more valuable information becomes available. If content marketing strategy is simply sharing valuable content in a strategic way that maximizes views and dollars, then essentially this includes all marketing today. Mistakes are a scary and unavoidable part of life. It’s how we learn and how we grow. As the old adage goes, you get ‘knocked down 6 times, and stand up 7’...or something like that. Content marketing is a compelling strategy that can capture the attention of an audience and heighten their sense of loyalty to a brand. One of the most common ways to take advantage of this type of marketing is with the use of a blog. The digital age is owned by search engines and social channels that all marketers must leverage to share content with their audiences. The content marketing landscape changes almost every week. We’re already halfway through the year, and marketers have seen their content strategies being moved by GDPR, Facebook updates, and influencer marketing trends. Marketers must shape content in new ways. Grab a drink and settle in. We’ve bundled up all the content tactics needed to create a successful content marketing strategy in 2018. Let’s get started. It’s coming. The connection of all physical things to the internet is on the horizon (and in some ways, it’s already being put into place). The possibilities of these new applications are seemingly endless, but this also means that with the interconnectedness of all physical objects to the internet, marketing strategy is going to take on a whole new meaning. The evolution is upon us, and as astute students of the marketing world, it’s time to buckle up and get ready for a new breed of digital marketing. Running a blog on your business website is an excellent way to draw attention to your brand’s products and services. Unfortunately, if you don’t produce relevant “pillar content” that captures your audience, you won’t go very far. As seasoned content marketers, we’d like to believe that we can magically teleport ideas to the screen, ready to publish. We want to be as prolific as George R. R. Martin and produce volumes of engaging content, with readers hanging on our every word. But sometimes, with our favorite font at the ready, and a perfectly calibrated Retina display, we sit down to create, and… nothing. Just a blinking cursor reminding us that time is passing by. No matter how well-intentioned we are, there are times when the inspiration well runs dry, and everything grinds to a halt. If this has happened to you, you know how frustrating it can be. Digital marketing has become the lifeblood of modern businesses. In the era of e-commerce and social media, a new marketing strategy called “inbound” has taken several industries by storm. If you don’t already know what inbound marketing is, keep reading. We’re almost halfway through 2018, which means it’s time to reflect on all of those trend pieces we read back in January. How and Why Does Google Change its Ranking Algorithm? Over the years, Google has cemented its place as the top search engine in the world, with over 3.5 billion searches a day. One of the big draws of inbound marketing is its ability to draw in leads that are in need of a product or service that your business provides. This is all done organically, but the problem is that inbound tactics can take a long period of time to show any major results. Google aims to match its users with content that best answers their questions and search requests. To accomplish this goal , Google’s search engine usually changes an does an algorithm update which finetunes the process. Google updates are generally met with anxiety because marketers don’t know which of their current practices will take a hit. Months of work can go up in smoke and your site can be taken out of the search index in the blink of an eye. It’s the period when everyone in the SEO space is kept on their toes. Marketing automation is incredibly powerful, but when you get started, it can also be incredibly overwhelming. After more than 200 HubSpot campaigns, I can safely tell you that the answer to both those questions is workflows. Let's face it. It's 2018, and with new technology, our capabilities of marketing at a personalized level continue to surpass what was possible, year after year. If you haven't started personalizing the majority of your digital marketing efforts by now, you might as well go back to promoting your content through a horse-riding messenger boy. As our communication styles continue to change and adapt, there is one channel that has persisted: email. Remember back to the day when you used to have an AOL or SBCGlobal account? While it seems like a lifetime ago and the majority of the public has moved on from using those services, the power of sending and receiving an email has remained strong. For many small business owners, the jargon of optimizing for local search rankings can be a daunting journey reminiscent of a Wizard of Oz-esque trek through the unknown. Sales and Marketing are both fundamental components of a thriving organization. Their co-existence should be a harmonious and symbiotic relationship. Yet all too often these two departments are at odds with each other, and ready to do battle over why leads aren’t closing, or sales goals aren’t being met. More than likely, Sales will criticize the marketing content for being off-target, and Marketing will blame the sales reps for being lazy and unmotivated. But what if Sales is right, and the marketing content is the problem? What can a supportive marketer do to be proactive and helpful and restore the alliance between the two factions? Remember the days when you could string together a bunch of keywords, throw it somewhere on your blog, and watch your website rocket to the front page of Google? Working with your marketing agency is just that — work! Similar to your personal relationships, the world’s most successful unions are those that take time and effort. Good marriages at home and in the C-Suite are not a one-way street. Both parties require putting their backs into making long-term relationships sustain themselves. True and meaningful bonds are not transactional. In fact, the best are symbiotic, where a mutually beneficial partnership emerges. Can Bots Write Good Marketing Content? We are living in an era of technological advancements and are heading toward a time when Artificial Intelligence may overtake human efforts. One such example is the growing use of AI bots in business. These robots seem to have found their place in various wings of businesses on everything from messaging platforms to apps. By now you are familiar with SEO and the use of keywords. SEO stands for “search engine optimization" which means that you optimize the page content on your website to boost results in search engines, the higher your website appears in search, the more likely that more traffic will land on your website, increasing conversion rates. What's the Deal with Facebook Chatbots? Right this moment, there are over 2 billion people on Facebook. Chasing its heels comes Facebook’s messenger app, Messenger, at 1.23 billion and rapidly growing. While many marketers have noted the importance of Facebook as a social media platform and a great place for digital ads in recent years, far too few have capitalized upon the opportunity to interact with customers more directly, through chat and messaging. Content marketing is the backbone of any Internet marketing campaign. If you're unfamiliar with the term, content marketing is the drafting, publishing, and sharing of “content” (i.e. blogs, articles, and releases) that inform your customers about your products, services, and issues related to your industry. However, creating content is slow and expensive. Your content marketing strategy needs to be written well, relevant, original and targeted to a very specific audience for it to perform well. This type of marketing strategy costs time and money but great content can drive clients to your website, and long-lasting blog posts can generate traffic for months, maybe even years. Email marketing plays a critical role in almost every modern internet marketing strategy, but what messages should you be sending to convert that mailing list into a rich set of high-potential leads? Good marketing using the latest tools emphasizes personalization and the nurturing of good relationships—here are the emails that make that happen. Social media marketing is one of the most transparent forms of marketing yet. It's interactive, responsive, and comes with its own set of data analytics tools baked into the websites. Social media's value is derived from its ability to interpret lead responses quickly, identify potential areas for improvement, and seamlessly integrate those improvements into future social media marketing campaigns. Social media campaigns enable companies to utilize much more targeted ads that provide value to your customers and returns for your company. Social media is a great tool in helping your brand tone of voice and brand personality shine through. While written content can help, the person to person interaction of social media can truly help your audience understand your voice and tone. Inbound marketing is one of the most effective strategies a company can leverage to increase sales of its products and services. Inbound marketing focuses more on the user experience while interacting with your brand, as opposed to focusing on the outbound marketing message you want to send. Inbound marketing brings more people to your company portals, like social pages or your website and blog, through more organic means than traditional marketing tactics. You’ve probably heard of it before. So many people vouch for it - the ever utilitarian funnel. While helpful for guiding liquids into tight spaces - why on earth would you ever use it for a content marketing strategy? Content marketing is just one aspect of an inbound marketing strategy. Content marketing involves generating free informational content (such as guides, articles, and eBooks) and blogs to generate inbound leads and conversions. The crux of content marketing is that your company becomes a trusted hub for information for your customers. Through the trust that your content develops, you can expand your customer base, build brand awareness, and create an engaging audience around your product or service. Many generations of marketers have depended upon traditional marketing methods, even as the underlying technologies of communication evolve—but just as many have worked behind the scenes on more effective, efficient approaches to nurturing leads, such as marketing automation. Unfortunately, it’s often been difficult to leverage these alternative marketing approaches to their fullest potential—but that’s all changed with the growth of the internet. Email marketing, social media marketing and marketing automation are all common tools to see now. How should you use them to generate more leads? Marketing is the key to exponentially growing your business. While the basis of any company is a great product or service, that is only half the equation. Customers will not purchase your “widgets” if they need to jump through 100 hoops to get there. Nor will they do it they have never heard of your product or your company. Ever felt like your writing and creating blog posts, but no one is looking? It's a common feeling in the industry. Topical writing that appeals to your audience needs to come out with timely and regular publishing if you want to attract interest. Once you have the audience attention, the idea is that your readers will move along the sales funnel and become leads. Inbound marketing is a proven strategy to generate highly qualified leads from around the web. It focuses on the needs of a target audience and utilizes a variety of tools to reach that audience such as social media, e-mail marketing and content marketing. Any marketing and content strategy expert will tell you that you need to use social media marketing, but not every channel is the same. Users engage with each platform differently whether that is Facebook, Twitter, SnapChat, or Instagram. As marketers, it's up to us to create messages that match how users engage with these platforms. Part of implementing a social media strategy is understanding the type of messages that are put out on different social networks. The power of permission marketing is the ability to turn strangers into friends and friends into customers. It does this by finding connections, shared history and other points of relatability among disparate people and brought them together. The commonality between you and your customer (turned friend) fundamentally changes the long-term relationship and enables you to amplify your marketing strategy. Video marketing is one of the most engaging methods to connect with your customers. You have probably run across kitschy, short, fun, and memorable videos on Facebook, Instagram, and even LinkedIn. This social video content uses cheap but engaging graphics, pictorials, short and punchy sentences that easily grab the attention of the audience. Most of these online videos are not much longer than a few minutes and they focus on one or two issues, making them very effective at engaging the viewer and leaving a favorable impact. What is a Bounce Rate and Why Should I Care? Your website is the primary storefront for your business. It is your window to the world of markets and potential new customers. It is crucial that you know what is working on your website and what isn’t. Are your landing pages converting leads? Is the website’s front-page drawing people in? Does your site look modern? Are the pages easy to navigate? You are probably asking yourself, what is the point of A/B testing? You know your product, your company, and your market. You don’t need a bunch of charts and graphs to tell you how to design your website, what products to offer, or how to adapt your emails, landing pages, or calls to action. Blog content costs time and money. As part of your regular content marketing strategy, you may publish anywhere between 12-60 posts a year. As time goes on, some of these posts will become dated, and other excellent content may become buried. Live video marketing has become a sensational trend in social media marketing and if you are not using it, then you are lagging behind. Introduced after the massive success of pre-recorded videos in marketing, live videos have spread through the various platforms like a bushfire. Originally used in traditional video streaming services like Twitch and Youtube, the trend has now spread to the mainstream social media platforms like Facebook, Twitter, Instagram, Periscope and Snapchat. Its massive uptake by the social media users globally has prompted brands and marketers to incorporate it in their marketing strategies and it is duly paying dividends. So, why is live video marketing so successful? How are brands using this revolutionary tool to market themselves? Social media has transformed real estate marketing in recent years. It’s never been easier to reach out to an individual and deliver a tailored piece of advertising, nor has the response to real estate marketing campaigns ever been as rapid. Understanding how to make proper use of social networks for marketing is particularly important for any business which deals in relationships more than products—businesses such as real estate. Many B2B companies find it challenging to convert their website visitors into leads. In fact, over 40% of B2B marketing professionals say that converting leads into customers is the biggest challenge they face. They don’t know where or how to begin, but they know they need more – and better – leads. For them, lead generation and conversion is still entrenched in the traditional methods of referrals, direct mail, cold calling and advertising. Outside of a few rare cases, leads don't convert to sales on their own. B2B customers face a number of challenges when it comes to making their purchasing decisions, from risk-averse procurement protocols to informal research conducted on social media and reviews sites. Nurturing a lead through to a purchase requires the active employment of B2B marketing strategies, and may help your company get an edge over the competition. In an era dominated by technology and everything migrating online, it goes without saying that every business needs to create a website to market their products and services. A website will not only help you set up an online shop to directly sell your services and products to your clients but will help increase your online presence and reach a wider audience. Marketing is an essential part of any business and it can make or break a company. This is why many businesses are so cautious about their marketing today. One of the biggest dilemmas that companies are faced with when looking for the best marketing strategies to boost their brands is the choice between an in-house marketing and working with a marketing agency. The dilemma here comes from the fact that most companies operate on a very limited marketing budget. The choice made depends on the priorities and long-term goals of the company and how the decision makers choose to try and help their businesses grow. Real Estate Marketing Trends: What Works? Real estate marketing has really come a long way. From the days of physical distribution of flyers and door to door marketing to modern day online marketing, real estate marketing is really evolving at a rapid pace. The incorporation of technology into real estate marketing has created numerous opportunities for real estate teams to market differently. While some may understand the importance of a structured sales program, others may not know how crucial sales can be to the success of a company, let alone the value of a structured program. Generating leads can be frustrating, and when the leads aren't being contacted, they can easily fall through the cracks. This was our challenge with PropertyADVANTAGE. PropertyADVANTAGE is a property management company based in San Diego that focuses on residential property management and Homeowner Association or HOA management. Founded in 2007, the PropertyADVANTAGE team have been consistent in their business, but failed to grow much farther than just word of mouth referrals. The company decided, in 2015, it really needed help if they wanted to grow, so they contacted us. The 41 Orange team was brought in to help the company figure out how to grow its business without relying on purchasing contracts. With a well-researched inbound marketing strategy and a tailored sales program, 41 Orange was able to help PropertyADVANTAGE achieve a 319 percent ROI by the end of the first year, projecting a 1,089 percent ROI by year two. However, the success wasn't easy to achieve. To learn more about our challenges and how we manage to grow the company despite those challenges, read on. Online marketing can be a daunting task for real estate agents and other real estate professionals. Some people get swept up in the metrics of online marketing, clicks, responses, emails, etc. It is easy to get excited at bumps in “traffic” to your website, but unless that traffic converts into a lead, it's not helping to grow your business. Think about it like this, if you were running a print or television marketing campaign, would you get excited at the number of households you reached? That's the not key measurement you should be measuring in this specific situation. The key analytic that should be measured is one set by the goals of your marketing strategy. We've outlined a couple of tips on how to establish a marketing strategy for those within the real estate industry. As the real estate industry has come around to using the multitude of online marketing tools available through the internet as opposed to past marketing methods such as direct mail, the speed and accuracy of all things marketing have increased rapidly. With search engine optimization and online real estate listings, marketing for real estate brands has become a lot simpler. If you're a real estate agent or a real estate business and your brand is falling behind the times, now is your chance to take advantage of these resources by creating a solid inbound marketing strategy for your real estate. The result will be more and better qualified leads all around. Creating dynamic content is the basis of an inbound marketing foundation. The philosophy of inbound marketing is simple: potential buyers come to you when you offer them information or services they are already looking for. For example, if you create an e-book or series of blog posts about increased longevity in investors and what this means for the field of financial advisory, you have made a desirable resource. There are search engine users looking for this content right now; as long as your search engine terms are optimized and your landing page is appealing, this resource will help potential clients find you. A successful inbound marketing strategy is all about remarkable content. It’s the motor that drives your website’s traffic and, without it, your chances of increasing conversions are dim. The most effective way to increase your blog's traffic and SEO is to strengthen the quality of your writing. Most people can adequately string words and sentences together to get their point across. They know the difference between its and it’s and you’re and your. But create content that engages, enchants, and goes viral? That takes a lot more work. Social media is more than a way to promote your brand - it's a connection to your leads that develops personal relationships. So what separates the good from the great in social media marketing? In order to maximize the return on your SEO investment, it is important that you follow the correct formula for determining what your audience is searching for. There are a wide range of tools available that can help you narrow down user searches to find specific keywords. Keywords are typically industry specific terms which your audience uses in Google or other search engine queries to locate what they are searching for. In order for your site to rank near the top of the list when people search, the content on your web page must center around those keywords effectively. This process also allows you to weed out search terms that you do not want to be associated with by leaving them out of your content. Inbound marketing has been proven as an effective method for lead generation. With a marketing strategy that focuses on a target audience through a combination of content marketing, SEO, social media, and email marketing, inbound is a more cost-effective method of generating b2b leads than traditional outbound marketing. Implementing an inbound campaign can attract a variety of different visitors to your site with an output of B2B leads -- some may become worthwhile customers, others may not be ready to purchase just yet, and some may have just come across your site out of curiosity with no intention of doing anything other than looking. 41 Orange Marketing Coordinator Sarah Laoyan takes you through her experience of learning inbound marketing and HubSpot, and what she’s learned to help you get up and running faster. As a recent college graduate, I was aware of basic marketing strategies and terminologies before starting my job as a marketing coordinator here at 41 Orange. During my training, I was introduced to HubSpot and inbound marketing, a technique that I only knew on the surface. This past year has been a monumental year for inbound marketers. According to Hubspot’s 2016 state of inbound report, 73% of organizations use inbound marketing as their primary approach to marketing. Of these organizations, 81% of them deemed their strategy as effective. With a lot of technological upgrades in the upcoming year, we’re anticipating a lot of changes coming to inbound marketing. Here are 41 Orange, we learned pretty early on that clear and consistent communication is key to a successful relationship. With advertisers and promoters constantly barraging inboxes with messages, what can you do to separate yourself from the masses? It's nearly Thanksgiving, and in the spirit of giving thanks, our team decided to reflect on the amazing tools we use every day that allow us to work efficiently, effectively and intelligently as a team. Talent and strategy only get you so far -- the technology we use enables our ability to implement and scale those inbound marketing strategies and utilize our talent in the best way possible. Search Engine Optimization (SEO) is an important tool to utilize to bring the right people to your website at the right time. It helps draw people to your website who are looking for your products and services, while establishing trust with your company and raising your authority as a website. When used incorrectly, SEO can push your content lower on search result pages, preventing traffic from coming to your page. You’ve implemented several traffic driving techniques and you’re starting to see the results. But you’re still not getting leads? You could be missing a step in the marketing process to turn those visitors into customers. With information readily available for any future customer, it’s important to understand where your ideal customers are within the buyer’s journey. By utilizing SEO, blogging, and social media, you’re targeting customers at the right moment, message, making it much more likely that they’re going to hear your message. It’s almost impossible to go through social media today and not encounter a video of some sort. And for good reason! Most people know that successful campaigns require very calculated and precise planning to achieve measurable and desirable results. This isn’t any different for deciding what kind of content to share with your prospective clients. That is why Brand journalism is becoming increasingly popular. Brands are now able to share more information with potential leads prior to them even reaching out. The benefit of this is two-fold: You’re able to boost your SEO rankings and in turn attract more leads to your website. If you’re considering adding more content into your marketing strategy, here is how to do it properly so you can actually generate more leads. As one of the fastest growing marketing strategies for online businesses, inbound marketing is highly cost effective when it comes to lead generation. Adblockers empower potential customers to opt out of traditional advertising methods, forcing businesses to shift away from traditional marketing tactics. Using inbound marketing, online businesses are able to utilize various methods to help customers find their brand. Tactics such as content marketing and social media marketing are used very effectively to generate leads, as well as inform and educate the consumer as part of the process to convert leads into sales. Here are six ways creative inbound marketing tactics can help to grow your business in 2017. I hate to tell you this, but there are only a handful of weeks before we enter 2017. I know, where in the world did the year go?! Nevertheless, a new year is almost upon us. That means it is time to start looking forward, examining your marketing and planning for the new year. If you are like many B2B businesses, you're likely entering your slower quarter as the holidays approach. Take that free time and channel it into your marketing now so you can start off 2017 with a bang and just completely crush it all year long. You're reading this because you've been paying attention. You know that content marketing and inbound marketing are not just the future of marketing, but the now. Because it works. Why else would global brands invest so much into their content? B2B online marketing offers immense value if used properly, but businesses that act without considering a particular channel's specific ROI risk wasting resources, money, and brand equity. You have to choose what is right for your company based on your goals. Understanding how each approach impacts your bottom line relative to its expense is crucial. In this article, we’ll be outlining the most effective B2B online marketing approaches affect a business. Online marketing is often the silver bullet that can take many real estate brands, property management companies and commercial design firms to new heights. But often these businesses either don't have the staff to manage a full marketing program in-house, or don't have the skills to do it at the level they'd like. That's when a marketing agency can step in to save the day! There are a couple simple ideas powering the current movement of online marketing: make it user-friendly, more informative, more authentic, not only because it builds brand equity but because the tools customers use to find their way online have become increasingly sophisticated. While marketing trends seem to change every week, it's pretty easy to see where everything is moving. If you're wondering what will stand the test of time and continue to dominate the best marketing strategies, read on. Marketing a mid-sized B2B company takes a lot of time and effort. You can't just assign the task of marketing your business online to employees with other responsibilities - you have to establish a team that is dedicated to launching and maintaining your online marketing. The thing is, even a small team of in-house marketers may not be enough to effectively manage your marketing efforts. Where Google ads were 10+ years ago, Facebook is now. It's a landscape ripe with opportunity. Few mid- and small-sized businesses have figured out how to really use Facebook ads effectively, so there is still lots of room in the market to grow. If you’re considering the value of Facebook advertisements for your B2B endeavors, it’s important to understand how far the platform has come in recent years. Once decried as a low-value investment due to poor targeting, ineffective delivery, and low engagement, Facebook has rapidly increased the potential of its advertising in recent years. Any business willing to invest in leveraging Facebook’s targeted delivery mechanisms to the fullest will find it an incredible tool for securing B2B leads. Marketing automation allows a small team to do the work of an entire department. It improves customer service, saves time and reduces staff error rates. In short, it could enable your company to reach new heights. It certainly helps increase your online leads and push leads through the sales funnel faster. Have you considered using a marketing and sales automation tool such as HubSpot for your business? Read on to learn more. Searching for a way to take your B2B online marketing up a notch in efficiency and efficacy? Instead of leaning into cold calls/emails or putting all of your eggs into trade shows or networking, consider leveraging the potential of authentic networking via LinkedIn groups. Nowhere else on the internet can you find a better-qualified group of prospects to engage for B2B marketing. Previously we wrote about how to get business from LinkedIn in less than 25 minutes per day. Part of that strategy is getting involved in LinkedIn Groups. You can use participation in the right groups to feed the top of your sales funnel with the best possible fuel: those people most likely to engage with your content, appreciate your offerings, and develop into satisfied customers. Let's dive in! We're going to use real estate as our example industry here, but know that there are groups for virtually any industry or vertical. Right now, if you want to generate leads there is no more effective and cost-effective way of doing so than with inbound marketing. According to Hubspot, inbound typically generates three times as many leads as traditional outbound marketing, and at only about one-third the cost. On top of that, SEO-based inbound leads have an average 14.6% close rate, versus only 1.7% for outbound methods. There are a lot of misconceptions out there regarding what inbound marketing is and whether or not you're doing it already. The fact of the matter is, yes -- most companies are doing pieces of inbound marketing. They may have an SEO optimized website. They might publish content a couple times a year. They may even have an email subscribe form on their site. But these are all just slices of the inbound marketing pie. With all of the emphasis that has been placed on search engine optimization, we often have clients telling us they want to increase their SEO efforts to generate new business. Yes, SEO is definitely going to bring you sustainable traffic over the long-run. It is critical to your lead generation strategy, but it is not a lead strategy on its own. It seems that every prospective client we talk to lately is buying lead lists to fuel their business. Many, many B2B industries are guilty of this, but real estate and construction seem to be repeat offenders. The social media landscape has changed. Just a few years ago, marketers were able to build an audience, push out content, and know that it would reach everyone. Now, that's no longer the case. With Instagram, Facebook, and other social networks leaning on increasingly opaque algorithms, brands need to be smarter if they want to make social media work for them. When blogging for business, it’s not enough to throw out whatever comes to mind; rewrites and rehashings may get you a post for the day, but merely filling up your blog with content isn’t enough. On days when that writer's block gets in the way and writing good, strategic content seems like a climbing Mount Everest, all you have to do is pull up this post for some ideas. Need to increase B2B sales? Try Blogging. Bringing in new customers is the lifeline of any business. In industries such as commercial real estate, construction, financial services or even architecture & design, marketers and salespeople alike have relied on handshakes and cold calls. But what if there was a better, more effective way to market your business? Blogging made it's way on the marketing scene in the early 2000s with "brand journalism." Savvy brands utilizing online content to climb in search results, gain new website traffic and connect with customers on a brand new level. Today, however, blogging has become an effective long-term marketing strategy that allows companies to bring in new customers with a more passive sales approach. The results of blogging over time typically result in more leads, contributing to sustainable and ongoing growth. "Inbound marketing with HubSpot generally produces 2x the amount of leads within the first 6-months." Good question. Inbound marketing is simply the term we give for the method of bringing the right people to your website and get their contact information for a potential sale. Inbound marketing utilizes tactics like blogging, social media and search engine optimization to attract the right people to your website. For instance, if you're reading this right now, you're more than like the right person for us at 41 Orange because we work with marketers who want to increase leads or salespeople who need more prospects. Next, when you have that person's information (and permission to email them) you can continue to send them relevant and helpful content (such as blog articles) to them to grow the relationship. Eventually, you'll trigger a need in that lead and they may reach out to learn more about your services -- then you work your magic and close a sale! Blogging is where it all begins. All the cool kids are using Instagram, but if you are a B2B marketer, you might think that you don't need to be up on this popular social media app. This would be a mistake. Instagram allows you to share photos and 15-second videos with your followers. It is a great way to promote visual content about your brand with the world. When you think about it, marketing to businesses is really directed at the people who work at those businesses. These people are looking to solve problems, fulfill needs and meet challenges. Instagram is just another way for you to showcase how your products and services can help. Best of all, since Instagram is used for social sharing and B2C marketing, your posts will reach your followers when they are not in work mode. This allows you to present a more fun and playful side to your brand. By making a more personal connection with your followers, you can cultivate long-term business relationships and alliances -- and perhaps even attract new leads. Congrats, You have leads! Now What? You’ve perfected the top of your funnel, cultivating several well-designed points of entry. Visitors are pouring in to your website, drawn by top notch content and savvy SEO, and once they arrive they’re taking action. You have more leads than you know what to do with as guests sign up for newsletters and submit contact forms. You’re halfway to success. What comes next? In a world of instant gratification, "Get it Now"s and real-time results, "long-term" has somehow become a dirty word. There's a pretty good chance that one of the main goals of your inbound marketing campaign is to improve your B2B lead generation. There are numerous strategies out there that can be extremely effective at generating leads if implemented into your overall marketing strategy correctly. However, the first step of creating an effective lead generation marketing program is understanding how to effectively reach your audience. This is accomplished through the creation of a buyer persona. Have you started thinking about Millennials in your B2B marketing strategies? It might be hard to believe, since they were "just kids" a few years ago, but they are rapidly entering management levels. According to Pew research, they are already the largest generation in the US workforce, and their numbers are only going to grow in the years to come. And if you try to talk to them like you talk to Boomers, they'll show you the door. There are probably few generation gaps we know of larger than that separating the Millennials from the Boomers. They have had vastly different upbringings, creating vastly different views on life. Knowing how to talk to them is going to be key to B2B marketing strategies moving forward. In order to run an effective inbound marketing campaign, a strong content marketing strategy is essential. Inbound marketing is all about putting yourself in a position for consumers to find you by allowing them to navigate the first part of the sales funnel on their own. 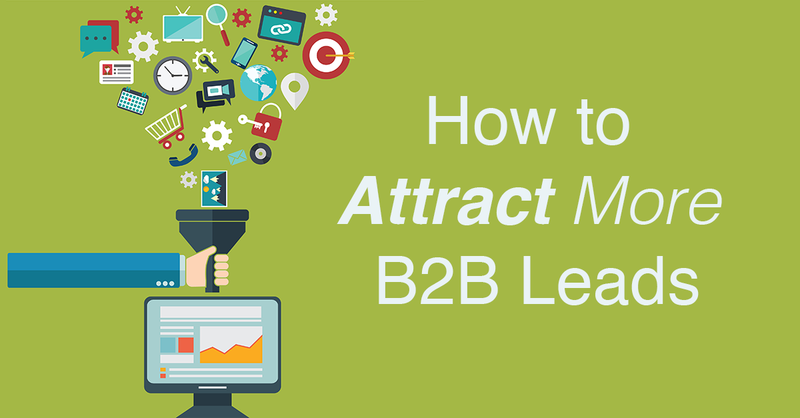 We've already discussed how to attract more leads to your website, but what do you need to do with them once they are there? It's time to capture their information. To accomplish this, content is required to both attract consumers as well as to inform and assist them to the point that they are ready to seek guidance through the rest of their buyer's journey. The following will help provide you with a better understanding of how and why content is so important to an effective inbound marketing campaign. Having a great website has been recognized as a necessity for B2C businesses for quite some time. Consumers have flocked to the Internet and love to search online for their favorite things to buy. Attractive websites with easy navigation have been proven to increase traffic, revenues and sales for retail companies. And now in the era of mobile search, these companies have jumped on the bandwagon of mobile-friendly websites. Outbound versus Inbound Marketing: Why Not Both? The marketing landscape has evolved dramatically over the last few years. With over 198 million Internet users using ad blockers and 84% of viewers skipping ads on TV, the notion of a captive audience is a thing of the past. People have changed how they consume media and engage with brands in whole new ways. They have grown accustomed to ignoring invasive, irrelevant marketing messages and look to interact with content that entertains and educates. The anatomy of a B2B marketing strategy is far different from consumer brands. Whereas most B2C brands will do business in volume to grow, we (B2B companies) rely on relationships, repeat business and loyalty to survive. Because this, it's crucial to know how to work each part of your sales funnel to build a long-lasting client roster. It is very likely that someone has already told you that blogging is a good idea. Blogs are a good way to let your customers and prospects know about your products, your brand, and get to know and trust the people behind your company. However, a blog alone is not going to attract the traffic you need to reach your goals for revenues and profits. Once your blog posts are written, they will not magically reach the audience you want. In fact, they might not reach any audience. That's where social media promotion comes in. You might be saying, "But Sam, we already post all our content on Facebook and Twitter. What more do you want?" To which I would reply, "Yes! That's great, but what else are you doing?" -- Do I hear crickets? Here's what's up: A study conducted by KissMetrics found sharing content at least three times on Twitter, Facebook and Google+ increase shares more than 100 percent. If you're not sharing your content everywhere you can, multiple times, then you're doing social media promotion all wrong. Last year, we here at 41 Orange were lucky enough to attend Hubspot’s annual INBOUND conference in Boston, Mass. It was a three-day whirlwind of learning, listening and sifting through it all at the end. But one keynote really resonated with me, personally, and it was Seth Godin’s talk on permission marketing. If you’re not familiar with Godin, he’s the godfather of permission marketing and coined the term in 1999. In fact, he literally wrote the book on it, “Permission Marketing: Turning Strangers Into Friends, and Friends Into Customers,” a winning must-read to enhance your permission marketing knowledge. For best results with SEO, it is important to take key steps when creating content. On-page SEO is not difficult to implement, it is just a matter of going through each step to ensure that you are maximizing your SEO opportunities for each post. The day of researching and qualifying every single business lead manually are coming to an end. Forget spending hours going through your leads to identify whether or not they are the right person. There's technology for that -- affordable technology. In fact, many of your marketing activities can, and should, be automated. Blogging is good for business. Actually, scratch that. Blogging is great for business. In fact, among a slew of fabulous statistics about just how good blogging is for your business is this: Companies who blog receive 97% more links to their website. And you know what that means? More traffic. Thought leadership. Being seen as an industry expert in the eyes of your customers. What sets apart good leaders from great leaders is the ability to drive and sustain growth in an organization. Successful business leaders know that marketing is the secret to successfully growing their company. Over time, we have noticed a lot of commonalities in successful business leaders—almost like a secret sauce that all savvy business owners know and value. We’d like to share the top nine facts about marketing that all those successful business owners and leaders know. As a business owner or head of marketing, your main responsibility is to grow your company. Everything you do is geared towards helping your company reach the next level. You know that in order to really grow, you need to invest in marketing your business. But before you invest in your marketing or even engage an agency partner for any marketing services, you need to decide what success really looks like for you. And we mean really defining what you and your team want to achieve through your marketing efforts. This is where "GPCT" comes in. Agencies were born out of need. Looking back, Volney B. Palmer opened the first advertising agency in Philadelphia, Penn. in 1850—the first of its kind in the United States. Palmer’s agency placed ads produced by its clients in various newspapers—basically a modern-day paid advertiser. And since the 1700s, agencies across the world have been helping business owners make their business more profitable, helping said business’ customers experience a better service, or merely let the world know they exist. It’s a need that’s been a need since the dawn of commerce. You've heard the rave reviews about how blogging helps generate new business. Excited and ready to give it everything you have, you jump right in. Blog posts are coming easily and quickly, and you're publishing regularly. But there's just one problem: You're not getting leads. If you're reading this article because your blog is not bringing in the business you want, let me just say this: You are not alone, friend. There are several reasons why your blog isn't generating new business for your company -- and they are quite common. Here's what to look for and how to fix the issue to start generating those leads! Inbound Marketing. You’ve probably been hearing this phrase getting tossed around more and more. The digital world is changing, faster than we could have ever imagined. And with Google at the helm, we are all set on the course that this Silicon Valley behemoth guides us towards. Where are we headed? Well, Google isn’t too keen anymore on SEO-keyword-overload or extreme keyword density, or any of the other tricks of the trade that savvy marketers have been conjuring up for the last few years. Traditional outbound marketing isn’t working anymore, either. The average human today is inundated with more than 2,000 outbound marketing interruptions per day—not much room for your business to break through, huh? Kickstarter has become the ultimate setting for the cinderella story. It’s the playground of makers and inventors, and the storefront for unique, one-of-a-kind objects. $2.1 Billion has been pledged on Kickstarter, and many people are vying for a piece of the crowdfunding pie. But striking it rich isn’t as easy as crowdfunding makes it seem. Oh no, on the contrary. Successfully raising money on Kickstarter is a lot of work. Just ask our good friend and client Niki Singlaub, inventor of HYDAWAY Bottle. Niki had a simple idea: What if there was a reusable water bottle that you could conveniently fit in the pocket of my backpack? Wouldn’t it be great if I could carry a water bottle for my kids instead of relying on store-bought drinks? That’s when the HYDAWAY Bottle was born. Designed for an active lifestyle, HYDAWAY bottles are compact, folding down like an accordion to just over one inch to easily fit in a pocket, backpack, or carry-on --nearly anywhere. With such a unique product, how could it fail? The HYDAWAY Bottle collapses down to easily fit in a pocket while you're on the go. It’s hard not to sound like an infomercial when you start pumping up the benefits of blogging for your business. “It’s great! Everyone’s doing it!” “You haven’t tried blogging yet?! You have no idea what you’re missing out on!” The cliches are endless, quite honestly. But, here’s the thing: They’re kind of true. Not only does blogging bring gobs of traffic to your business’ site, but that traffic is prime to be converted into leads. Once you shake that organic traffic tree, you have no idea what might come tumbling out. 41 Orange Now Offers Inbound Marketing Services! Facebook, LinkedIn, Instagram, Pinterest, Twitter—it seems like the list of social media websites grows larger all the time. For the business owner who has decided to make digital and inbound marketing an essential part of the business plan, these social media websites are a crucial part stepping stone to success. However, it can become quite time consuming to hit every platform, every day. There may become a time where you have to pick and choose a couple of these social media websites to be your “go-to” source for social lead generation. B2B Edition: How Much Should I Spend on Marketing? This talk was originally presented by Samantha Anderson at SAGE Talks, put on by the Sage Executive Group in San Diego. In order to invite your existing customers to offer referrals, you need to be able to prove to them why they should refer you to their friends. For them to refer you to qualified leads, they will have to trust you. But trust will come naturally after you have spent time building a relationship with them through the previous steps of the inbound marketing process, Attract, Convert and Close, and the final step, discussed in this article, Delight. We've been going over the Inbound Marketing methodology, discussing how B2B companies can gain clients and grow revenue. The first step, attracting visitors, focuses on turning strangers into visitors by offering them valuable content through a variety of channels such as social media, blogging and SEO to attract them to your site. The second step is converting visitors into leads via the use of landing pages, calls-to-action and personalized offers. The next step is closing sales, turning those leads into viable customers using inbound techniques to establish a relationship, build trust and eventually make a sale. Yelp has really become a necessary evil for most businesses. Let's face it, no one enjoys reading negative comments about their business. But we have to reshape that thinking. It's not so much a complaint as an opportunity to turn an unhappy customer into a brand evangelist. Remember, inbound marketing isn't just about getting business, but driving loyalty through delight too. The customer journey in inbound marketing doesn't stop once they get to your website. Attracting potential customers to your website through a variety of tactics is just step one in the sales process. The next step in the sales funnel, what happens once the visitor lands on your site, is an absolutely crucial step to capturing traffic and understanding how to turn them into dollars. It's the beginning of the year. Your boss tells the marketing department that he wants to increase the number of leads coming into generate more revenue by the end of the year. Your department just launched a beautiful new website and you're feeling optimistic -- but when you go to look at your numbers, nothing is happening. No leads are coming in. In fact, there is very little traffic coming to your website to begin with. You know that in order to generate leads through your website, you really need to drive in more visitors from around the web. There is little to no paid media budget this quarter, and you know asking for it is out of the question. The online marketing climate has changed, and so have your resources. Inbound marketing utilizes constant information flow to invigorate the consumer. Gone are the days of spam emails, information-pumping services and general appeal. The Inbound methodology provides a strong framework for your marketing campaigns and your business as a whole. In fact, HubSpot found that companies, no matter B2B, B2C or nonprofit, are three times as likely to see a higher ROI on inbound marketing than on outbound campaigns. It really works. Not so long ago, most marketing was called outbound or even interruption marketing. It consisted of advertisements that interrupted exciting TV shows or cold calls that interrupted important business meetings. The only thing that advertisers knew how to do was talk to consumers, even when those consumers were not in the stage of their buyer's journey where they were ready to be talked to. Every year, HubSpot surveys thousands of marketers and salespeople about their priorities, challenges and the tactics they've used to tackle those challenges for their State of Inbound report. This year the company spoke to nearly 4,000 from more than 150 countries, many of whom are marketers at B2B small or medium sized businesses. Live event coverage perfectly showcases all that an event has to offer, and is also a great way to get people talking about the event--especially if the event is reoccurring, like a trade show, conference or block party. It is also an effective way to show people what they are missing, and get them thinking about going next year. If you are not doing social media coverage for your events, you're missing out on a big opportunity to grow your audience. If you read about how to brand your startup, it is likely you will get advice on how to carefully choose the name of your company. Some will say that you should choose a name that represents what you do. On the opposite side, others will say your name should be completely unique—you have to claim those urls, handles, usernames, etc., and you can’t do that if there is already someone out there with a similar name, right? There is an endless supply of advice out there about how to name your brand—and the 'experts' all have different opinions; however, there is one crucial piece of advice almost always overlooked: Honestly, it doesn’t really matter what your name is, as long you tell a compelling story.